In the northern rebel-held areas of Syria in particular, the notion of judicial independence tends to be elusive. The Dar al-Qada, for instance, has been officially characterized as independent but is widely acknowledged to be in reality the judicial wing of Hay'at Tahrir al-Sham and prior to that its main predecessor Jabhat Fatah al-Sham and in turn Jabhat Fatah al-Sham's predecessor Jabhat al-Nusra, Syria's al-Qa'ida affiliate. The Islamic Commission, another judicial body, is noted for its links to Ahrar al-Sham. 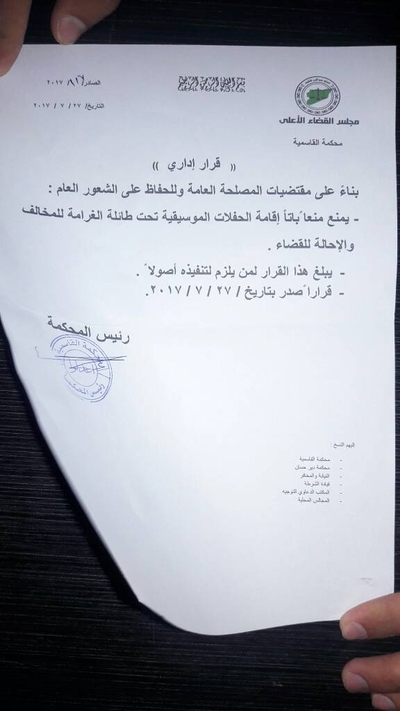 The documents translated for this post come from a judicial body called the Supreme Judicial Council, which, as I noted in a previous entry, announced the beginning of its operations on 30 July 2015 with a number of branches in Aleppo province, including the west Aleppo countryside locality of al-Qasimiya that is the focus of this post. Though the Supreme Judicial Council, like the Dar al-Qada, is officially proclaimed to be independent, its branches are linked to the factions that administer the areas in which these branches operate. Thus, in Azaz, where a branch of the Supreme Judicial Council existed, the court was de facto affiliated with the Shami Front, the main faction in control of Azaz. In al-Qasimiya, the court is de facto affiliated/linked with the faction administering the locality: Harakat Nour al-Din al-Zinki, which had previously signed up to Hay'at Tahrir al-Sham, only to split from it in light of the recent infighting in Idlib where Ahrar al-Sham suffered major defeats at the hands of Hay'at Tahrir al-Sham. The links of the al-Qasimiya court with Harakat Nour al-Din al-Zinki were confirmed by Ahmad Hamamer of the group, who pointed out to me that even when Harakat Nour al-Din al-Zinki was part of Hay'at Tahrir al-Sham, there was no change to the official affiliation of the court in al-Qasimiya (i.e. it remained officially affiliated with the Supreme Judicial Council and did not become a branch of the Dar al-Qada). The al-Qasimiya court's connections predate the formation of the Supreme Judicial Council: that is, there was already a court in al-Qasimiya affiliated with Harakat Nour al-Din al-Zinki before the Supreme Judicial Council was set up. More generally, it should be noted that Harakat Nour al-Din al-Zinki was close to Khalid al-Sayyid, the overall head of the Supreme Judicial Council who was killed in October 2016. 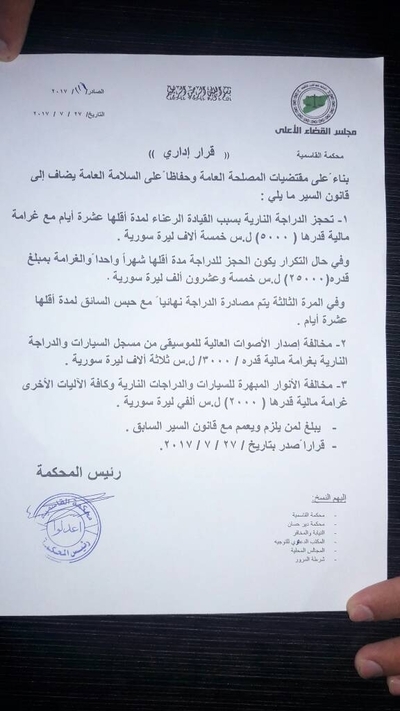 There have been many allegations of criminality, abuses and corruption in relation to the al-Qasimiya court's links with Harakat Nour al-Din al-Zinki and the group's own reputation, with claims that kidnappings and demands for ransom have been widespread in areas controlled by the group in west Aleppo countryside. Mahmoud Bitar, who was doing work with the Syrian interim government and was imprisoned in the al-Qasimiya court in 2014, has criticised the apparent consensus among judicial groups in some of the rebel-held areas on the preference for torturing a detainee to extract confessions, including the hitting of detainees with electrical cables on the soles of their feet to extract those confessions. Based on his experiences, he cites Harakat Nour al-Din al-Zinki's court in al-Qasimiya in 2014 as representative of these problems. One should compare his criticisms with a report by Souriatna in April 2015, which notes a case of two workers in a foundation in Aleppo being subject to arbitrary arrest, beating and torture in the al-Qasimiya court by members of Harakat Nour al-Din al-Zinki. In short, the debate over the group's supposed ideological moderation or extremism in relation to the infamous beheading incident, as I have discussed in part previously, is misplaced. What is striking is the continuity in Harakat Nour al-Din al-Zinki's behaviour, contrary to Charles Lister's claim that it was somehow only the group's "recent actions" that were "disgusting" and that the "Zinki of 2014 was not the Zinki of '16 (groups evolve; AQ [al-Qa'ida] poached)." In the group's history, nothing points to a clear ideological shift, and one wonders how al-Qa'ida supposedly "poached" Harakat Nour al-Din al-Zinki. In fact, Harakat Nour al-Din al-Zinki chose to merge with Hay'at Tahrir al-Sham and chose to have a close working relationship with its predecessors, even while never being an advocate of jihadism. Meanwhile, throughout the period of 2014-2016 that Lister refers to is clear evidence of criminality and human rights abuses by Harakat Nour al-Din al-Zinki. 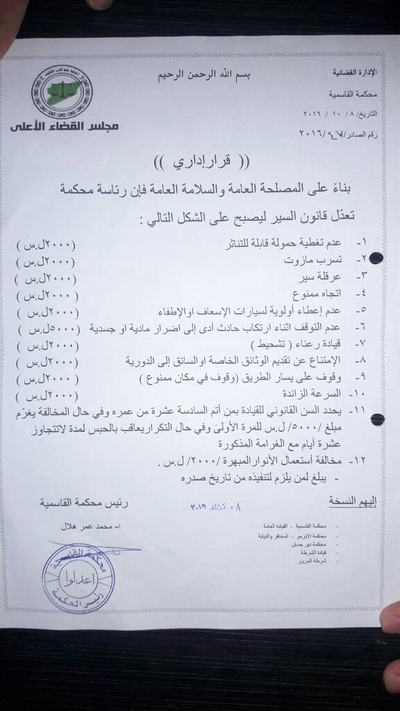 Below are the documents of some administrative decisions from the al-Qasimiya court with translation. One document dates from October 2016 and appears to have been redistributed in light of some more recent additions to the regulations detailed in it. - It is absolutely forbidden to hold concerts under penalty of fining the violator and referring him to the judiciary. - This decision is to be conveyed to all required to implement it with due process. - Decision issued on 27 July 2017. 8. Refusing to offer particular documents or the driver to the patrol: 2000 Syrian pounds. 10. Speeding: 2000 Syrian pounds. 11. The legal age for driving is defined as whoso has attained 16 years of age and in the event of violation there will be a fine of 5000 Syrian pounds for first time and if repeated the punishment will be imprisonment for not more than 10 days with the aforementioned fine. 12. Violation of use of dazzling lights: 2000 Syrian pounds. This decision is to be conveyed to whoso is required to implement it from the date of its issue. 1. The motorcycle that is used for reckless driving will be confiscated for at least 10 days with a fine of 5000 Syrian pounds. If repeated it will be confiscated for at least one month with a fine of 25000 Syrian pounds. On third time it will be confiscated for good and the driver will be imprisoned for at least 10 days. 2. The violation of emitting loud noises of music from the radio player of cars and motorcycles will be met with a fine of 3000 Syrian pounds. 3. Violation of dazzling lights for cars, motorcycles and all other vehicles will be met with a fine of 2000 Syrian pounds. This is to be conveyed to whosoever is bound by it and is to be distributed with the previous traffic law. Decision issued on 27 July 2017. The locality of Deir Hasan mentioned in these documents lies in the Aleppo-Idlib border areas and also appears to fall under Harakat Nour al-Din al-Zinki administration/control. Like the al-Qasimiya court, the court in Deir Hasan is officially affiliated with the Supreme Judicial Council but is described in a post from May 2017 as affiliated with Harakat Nour al-Din al-Zinki. Again, true judicial independence is difficult to achieve in the environment of armed factions.